Baby is the size of a coconut or a roller blade! Interesting stuff! Changes I've noticed: Veins guys. VEINS! All over! It's not that I've just suddenly noticed them. I've just recently noticed how horrifyingly prominent they are. Surely they will chill out when Baby Girl gets here. I hope! How I've been feeling: Emotional! On a normal day, I'm a fairly emotional person. With all of the devastating news both in the world and amongst those facing struggles on my social media feeds...and all of the the extra time I've had to take it all in...the emotions are catching up to me. Don't get me wrong, I'm usually REALLY good at filtering it all and taking it in stride, but these hormones have me on EDGE! Luckily, potty training has been keeping me very occupied so I can't dwell for too long! How I've been sleeping: Sleep hasn't been a priority for me...my schedule is that there is no schedule. I'm going to have to make more of an effort to get my beauty rest in! There are no issues falling asleep, I'm just a night owl. I think it also has to do with the fact that it's the only time when I feel like I have "me time". Besides nap time of course! Food and exercise: I feel SO MUCH BETTER! Since being on summer vacay, I've been consistently doing my Beachbody workouts, stretching, using weights, squats, all of it! I don't think I've lost weight, but I'm thinking I haven't gained any either. Stepping on the scale is no longer part of my routine so I guess I don't really know for sure. It's like the bloating is leveling out finally. I've been eating much better (excluding last night's bowl of ice cream and the fried appetizers at Applebees on Wednesday) and consistently drinking my Shakeology. Despite my overall improvement in food choices....I failed my glucose tolerance test. Ugh, this happened with Ella too. Hopefully I pass the three hour test on Monday and it's a non-issue again. 1. Besides Target, there's not really anywhere around me that sells maternity clothes. I'm WAY too lazy to order online and then wait for it. I'm an instant gratification kind of gal. If I can't have it now, the moment eventually passes (sometimes...I know my husband may disagree with this). 2. It's expensive and if I look hard enough, I can find things that are not maternity that fit! Challenge accepted. I did find some shorts that I plan to wear the hell out of. 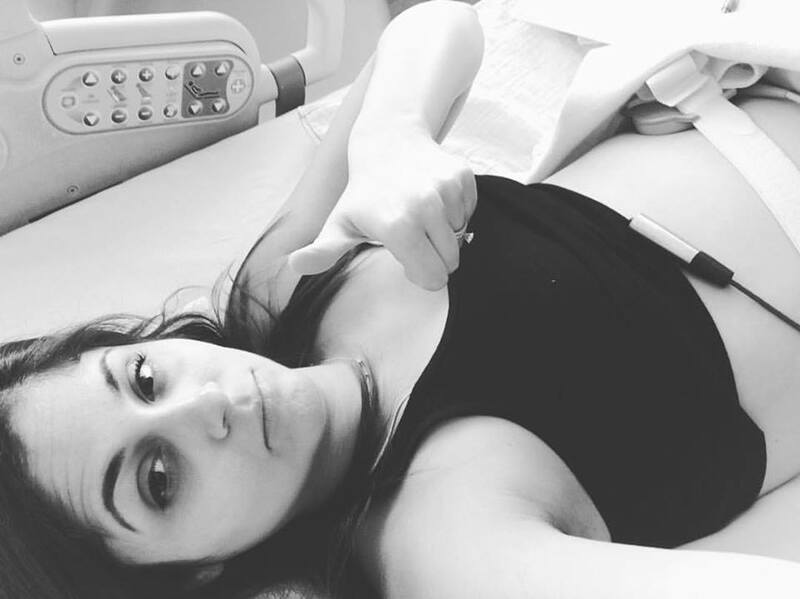 Movement: At my appointment on Monday, I just happened to mention that I've been feeling baby a little less than usual for the past few days. I wasn't concerned that something was wrong, just brought it up casually in conversation and expected that my doc would tell me it's normal to notice a little bit of a difference at this point. Although she did say these things, she wanted me to go straight to the hospital for a non-stress test just to check on the peanut. Of course this is when Baby Girl started to move around like her typical crazy self...and I went through the motions to be sure anyway. All checked out fine! At no point was i actually worried, but it was good to hear her heartbeat and monitor all of her acrobatics for the morning. Best moment this past week: Ella came home from school with a beautiful "Big Sister Ella" shirt from her sweet teachers....and a matching onesie for "Little Sister ______". I'm not ready to share her name on here yet, but OMG it was so cute. Ella was SO excited about it too! She really "gets" that she is going to be a big sis...and soon! 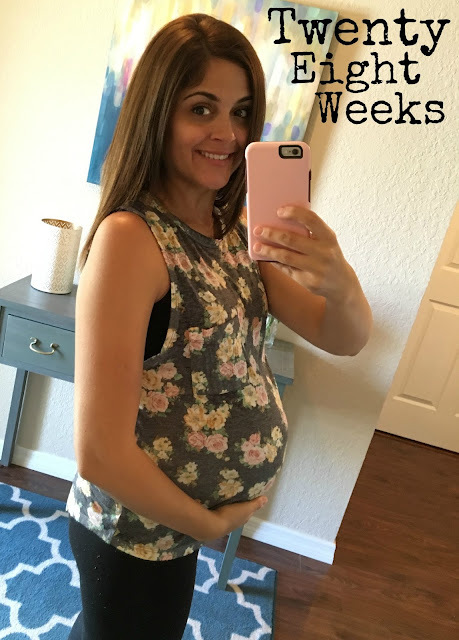 Click HERE to check out 28 Weeks with Ella Rose!